Any legal effort to challenge the constitutionality of the National Popular Vote Interstate Compact (NPV) will have to wait until enough states formally adopt the measure, according to numerous constitutional and legal experts on the matter. Opponents to NPV have long consoled themselves with the fallback idea that even if enough states might eventually join the compact, it would likely be found unconstitutional in the courts. The NPV is an agreement between states that enter into the compact to change the way a state casts all of its Electoral College votes, typically awarding all of them to the candidate that wins a plurality in that state. Instead, once the votes are tallied across the country, states in the NPV would cast their Electoral College votes to the candidate who won the most votes nationwide, regardless of whether the candidate carried the state. If enough states had the compact in place in the 2016 elections for example, it would have meant Hillary Clinton would have defeated Donald Trump, because she won more votes nationwide. The NPV does not go into effect until the number of states that have joined have a combined Electoral College vote count above 270, the number needed for a candidate to win the presidency. 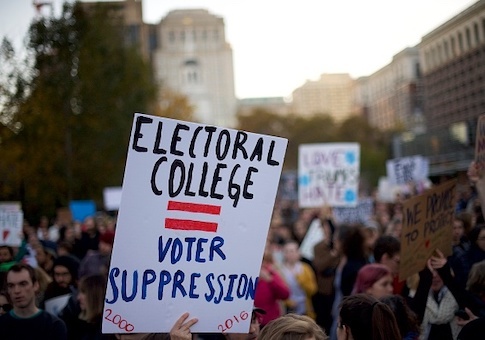 The effort is still a long way from having enough participating states to effectively change how the Electoral College operates, and states that have joined so far are mostly Democratic strongholds. However, the NPV's advancement this spring in Colorado demonstrates progress in one of the most "purple" states to date, suggesting the compact is less far-fetched than it was a decade ago. Constitutional legal challenges often take years, leading forward-thinking opponents of the effort to ponder the earliest-possible moment to launch a legal challenge in order to avoid a Bush v. Gore-style emergency legal proceeding deciding the presidency. If a legal challenge were begun after a November presidential vote, it could undermine the legitimacy of the winner, circumstances all-but-guaranteed to produce immense political uncertainty. "It would be very unpleasant and dangerous for the country if the lawsuit were to happen under those circumstances," sail George Mason University legal professor Ilya Somin. "It is possible that a lawsuit could be launched earlier than that, at the point where they have 270 electoral votes worth of states but there isn't any election or crisis going on." John Samples, vice president of the libertarian-minded CATO Institute in Washington agrees. "I think the reason you've seen nothing so far is it's not actionable yet," Samples told the Washington Free Beacon, noting that all of the legislation passed by state legislatures remains only an agreement at this point. "The compact is designed in such a way that it doesn't come into existence until you get that state that provides the [270 vote] majority. So you have to have states with a majority of Electoral College votes before the compact exists. So it doesn't now, and presumably anyone that sued to stop this would lack standing." The legal concept of standing has derailed many court cases thought to be easily decided. "Standing requires the plaintiff to show that he has been harmed or faces the threat of harm in the immediate future as a result of the defendant's acts," said Rob Natelson, a Constitutional legal expert with the Independence Institute in Colorado. (Disclosure: This author previously was employed at the Independence Institute). "Before NPV is approved by the requisite number of states, we have no way of knowing whether actual harm will come to anyone because it may never become effective. Hence, no plaintiff could demonstrate standing." Most constitutional and legal scholars agree that the portion of the Constitution that defines and gives authority to the Electoral College also gives states wide flexibility in how they assign their votes. The key to a successful legal challenge, they argue, is using the "compact" clause of the Constitution, which says states may not enter into compacts with other states without the approval of Congress. The overall NPV effort has been active for more than a decade now, but a push for new electoral votes began soon after the November elections, especially in states that had newly formed Democrat "trifectas." Colorado Governor Jared Polis (D.) signed a bill late Friday night bringing the tally of votes from NPV states to 181. An NPV bill has also passed both legislative chambers in New Mexico and is awaiting signature by Governor Michelle Lujan Grisham, also a Democrat. If New Mexico joins, it will add another five Electoral College votes.